The ESB is represented as a compound pattern comprised of a series of core and optional patterns that co-exist to establish an environment with a specific feature-set. Figure 1 shows the pattern hierarchy that comprises Enterprise Service Bus . Figure 1. 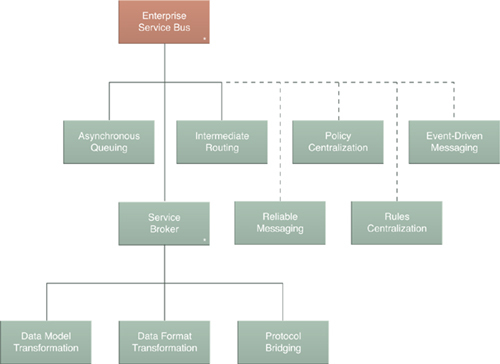 The Enterprise Service Bus compound pattern. The patterns connected with dashed lines represent optional extensions to the core model. One of the most common questions that arise when exploring Enterprise Service Bus patterns in relation to Microsoft platform technologies is whether BizTalk Server itself is a fully functional ESB. The answer to this depends on the definition of “fully-functional.” As shown in Table 1, when we take a look at the individual feature-sets represented by the patterns that make up Enterprise Service Bus, we can identify several dynamic runtime capabilities that can be provided by Microsoft platform technologies beyond BizTalk Server. What BizTalk Server and the ESB Toolkit establishes is a series of building blocks that, when combined with other parts of the Microsoft technology stack (and some diligent design effort), can result in a middle-tier technology architecture representative of a full-featured ESB. Coverage of the individual technology architecture and infrastructure components that relate to the individual Enterprise Service Bus patterns is provided in the book Modern SOA Infrastructure, as part of the Prentice Hall Service-Oriented Computing Series from Thomas Erl.